Nora Hoffmann grew up in Germany, learning music at 5 years old, and classical violin at 6. Early on, she was drawn to contemporary music, being part of an international organization for furthering new music, Korrespondenzen, in Baden-Baden, Southwest Germany ("Baden-Wuerttemberg"), under the guidance of violin teacher and virtuoso Dora Entcheva-Heinen. This inspired her to venture into free improvisation as a means of exploring authentic musical expression moment to moment. She spent her early twenties in Berlin, performing in various constellations: with bands, visual artists, dancers, poets, DJs, and solo. 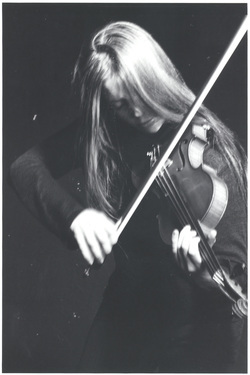 Nora moved to Oakland, California, in 1999 to deepen her understanding of free improvisation and experimental music at Mills College. Nora also has an MFA in Composition/Experimental Sound Practices from the California Institute of the Arts. Appreciating & acknowledging as influential in her musical development: Fred Frith, India Cooke, Maggi Payne, and Pauline Oliveros. Mark Trayle, Vinnie Golia, Anne LeBaron, Clay Chaplin and Susie Allen. Currently Nora lives in the San Francisco Bay Area. In addition to music, she helps people with their relationship with money through coaching and bookkeeping, and provides communication training and healing arts to groups, couples and individuals. all content copyright Nora Hoffmann.